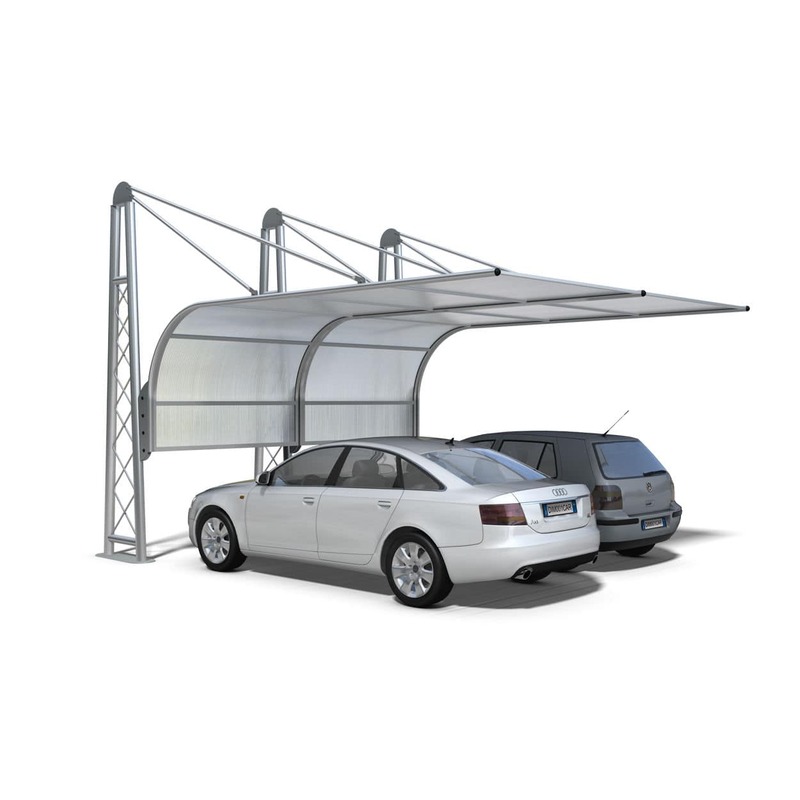 Galvanized steel carport / polycarbonate / for parking lots - AIRONE 336 - DIMCAR s.r.l. Public spaces > Urban furniture > Polycarbonate carport > DIMCAR s.r.l. Galvanized steel cover used for vehicle parking, Airone model. A structure made of triangular vertical uprights consisting of two galvanized steel tubular tubes spaced by two galvanized steel tube crosspieces and decorated, in the interior, by a galvanized steel tube trellis. Each single upright is provided with a plate, base, galvanized sheet. Galvanized steel round tubular reinforcement bars and brackets for connecting the vertical galvanized metal upright cover. The cantilevered roof is made of opaque polycarbonate, supported by round steel round arches with ball end caps in PVC and rectangular galvanized steel tube. The fixing is done by means of a plinth or a cement base; Through the extension of the support uprights in the subsoil. The cover is supplied in assembly kit with stainless steel screws and assembly instructions. The base finish for this product is "brilliant aluminum". The customer may, however, require a different finish, chosen from the RAL colors available on our website. The painting technique used for the galvanized steel structure is made of thermosetting powders with baking.